Our company’s President, Rick Hodges, was one of several hundred attendees at the rotunda of the RI State House for a rally yesterday to save job training funds. 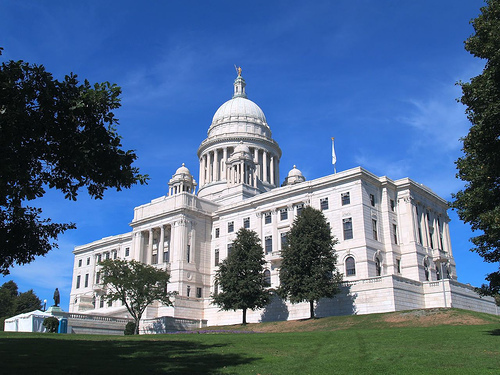 As part of their plan to reduce the state’s $220 million deficit, the RI state legislature has proposed eliminating $1 million in state job training funds. Hodges was part of a large crowd that included state business owners, labor leaders, and Governor Donald Carcieri. Hodges Badge has benefited on numerous occasions from the job training and development grants administered through the Department of Labor and Training and RIMES. In particular, we have worked with RIMES (the Rhode Island Manufacturing Extension Service) to bring our employees through Lean and 5S training. Fund is the worst outcome we, as Rhode Islanders, could have,” stated Hodges. “Our state has a number of financial problems, but taking these funds (or the Renewable Energy Funds) is not a reasonable way to close the deficit,” he added. In order to spice up our blog with more news from outside the Hodges office, we have decided to introduce a new group of posts, the Featured Customer Series. The series will let our readers know a little more about some of our customers and give a heads up on an event they’re hosting. Our first featured customer has their event rapidly approaching. 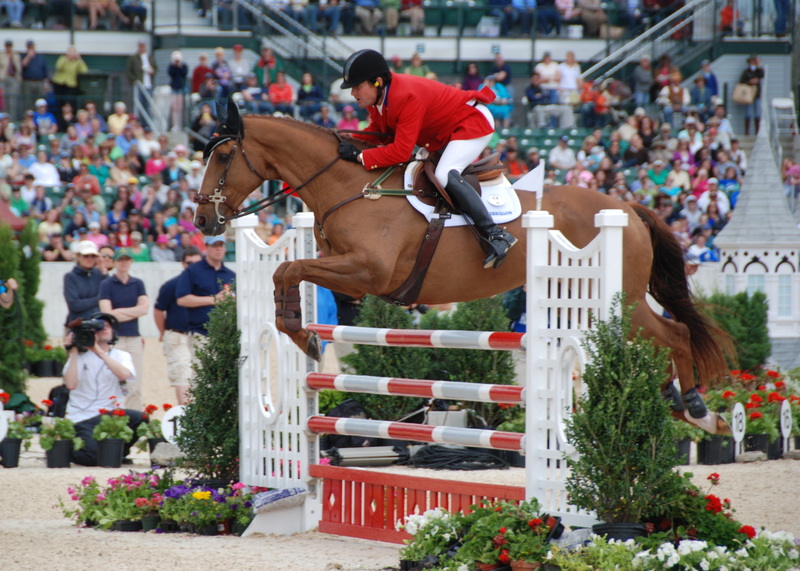 The Garden State Horse Show takes place May 5-9 at the Sussex County Fairgrounds in Augusta. Now in its 59th year, the event is the biggest horse show in New Jersey, with AA rated hunter classes and up to 8 rings going at once. Now for a little history. Back in 1951 the show started as the Junior Essex Troop Horse Show. The Junior Essex Troop was a junior cavalry organization formed by members of the 102nd armored cavalry unit after World War II. The JET show became the largest all-junior show in the country before adding adult classes and eventually being renamed in 1984. Today the show offers competition classes in hunters, equitation and jumpers for all levels of riding, from leadline to Grand Prix. New this year will be the Devoucoux 3’3″ Hunter Derby. 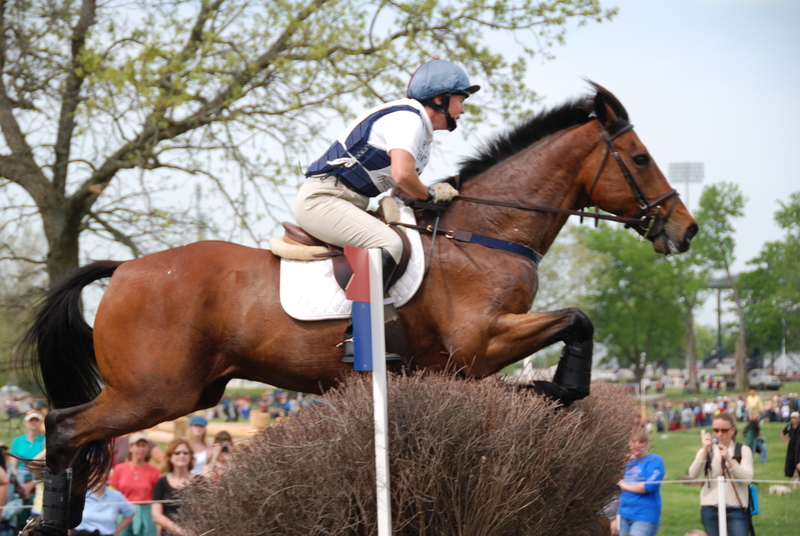 Drawing the largest crowd are the two Grand Prix classes- the $25,000 Welcome Grand Prix on Thursday and the $50,000 Junior Essex Troop Garden State Grand Prix on Saturday. 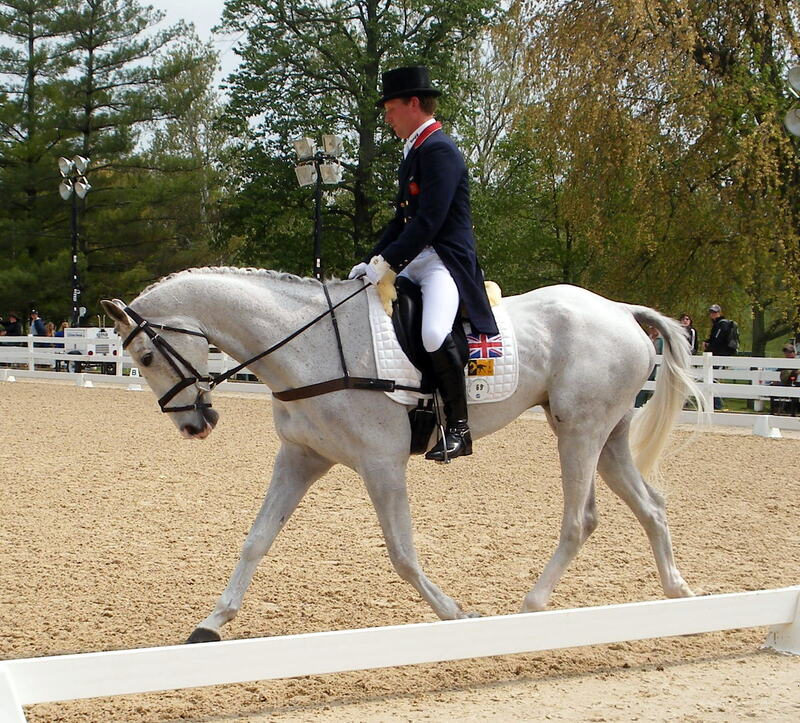 The classes have been known to draw big names, with 2009’s event won by Olympian Leslie Howard. 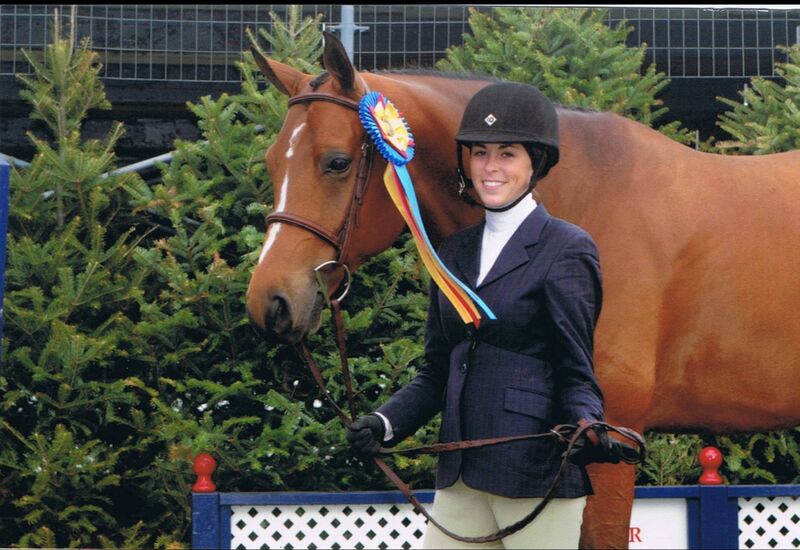 Here is 2009’s Adult Amateur Hunter Champion Masterpiece with rider Danielle Devincentis. Garden State chose the Wheaton Rosette with custom coin center for its division champions. I realize we’re two days late in reporting from Rolex but I hope you’ll still enjoy seeing some more photos we took while ringside on Sunday. 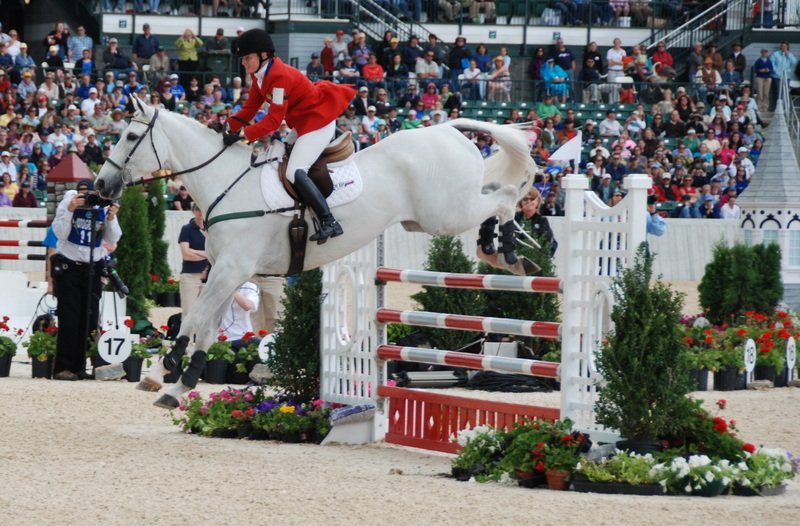 The crowd was fired up and it was an electric environment- everyone cheered after each clear round or clear effort over the triple combination. Capt. 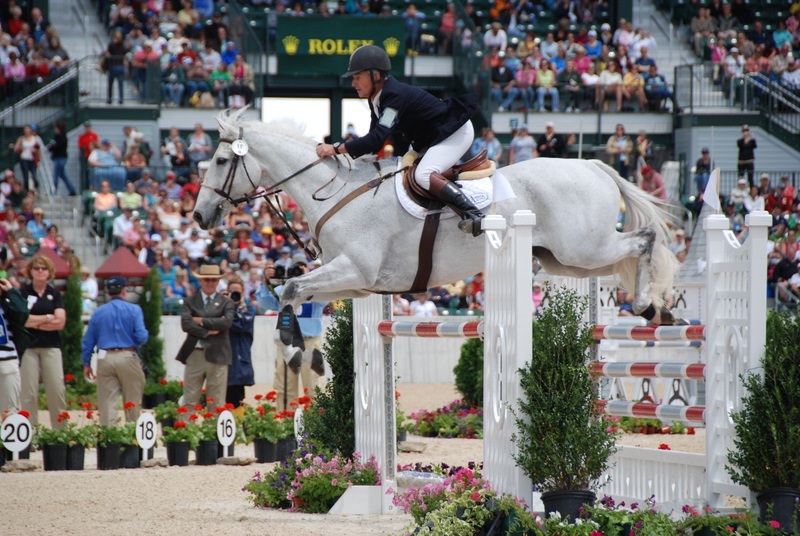 Geoff Curran had 8 faults on The Jump Jet. Here is Napalm and Ian Roberts, who finished just inside the top 20. This is Kyle Carter and Madison Park. They had 4 faults to finish 13th. 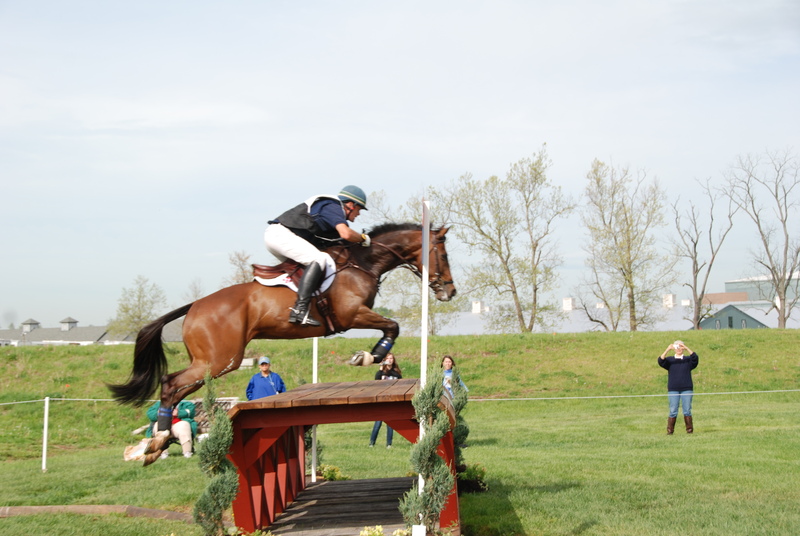 Phillip Dutton and Woodburn went double clear and finished second. Kim Severson came into the stadium round in second but unfortunately had a refusal and rails down to knock them out of the placings. 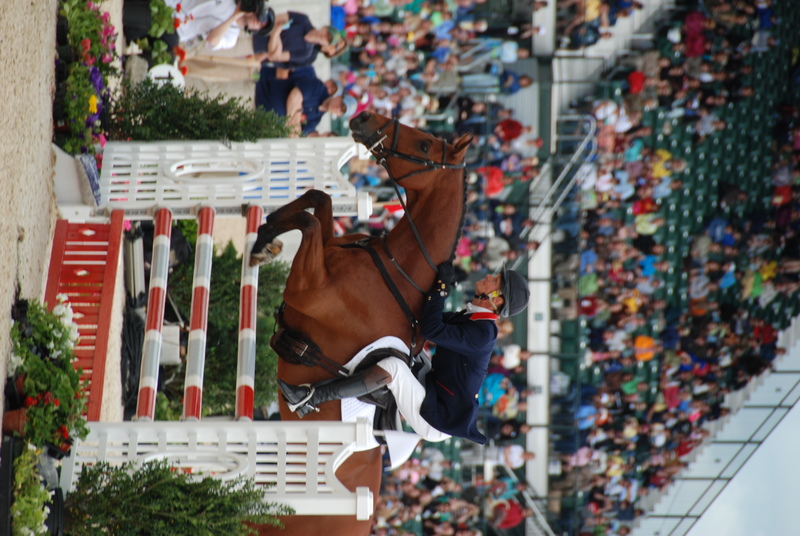 And the winner… British rider WIlliam Fox-Pitt claimed his first Rolex title after 6 trips to Kentucky. He lead the competition from start to finish, with a dressage score of 42.8 and no faults in cross-country or stadium jumping. Our second day in Kentucky started wet and dreary, with forecasts of heavy thunderstorms and hail. The schedule was shortened up, with no lunch break and riders starting every 4 minutes. This enabled most rides to take place under hazy skies, moderate breezes and just wonderful conditions. The rain held off until about 30 minutes after the last ride, so it was a really great day. 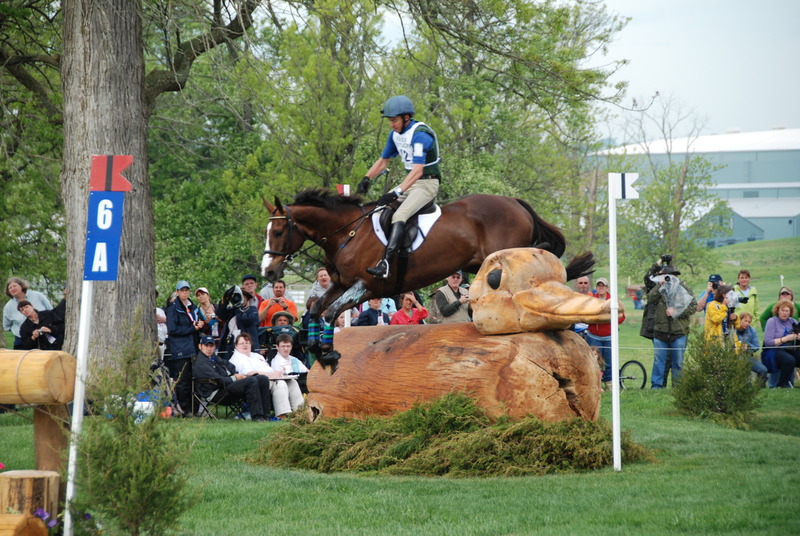 The Rolex web site (rk3de.com) has the ride by ride summary of the day, I just have a bunch of photos to share with you. So look below for some of my best photos from Saturday’s Cross Country competition. #12 Peter Atkins and Henry Jota Hampton over fence #6A, the Ducks. Rider #17 over fence #4, the Covered Bridge. This would be Kyle Carter of Canada on Madison Park. #24 Will Faudree on Pawlow over fence #23, the Keeper’s Brush. 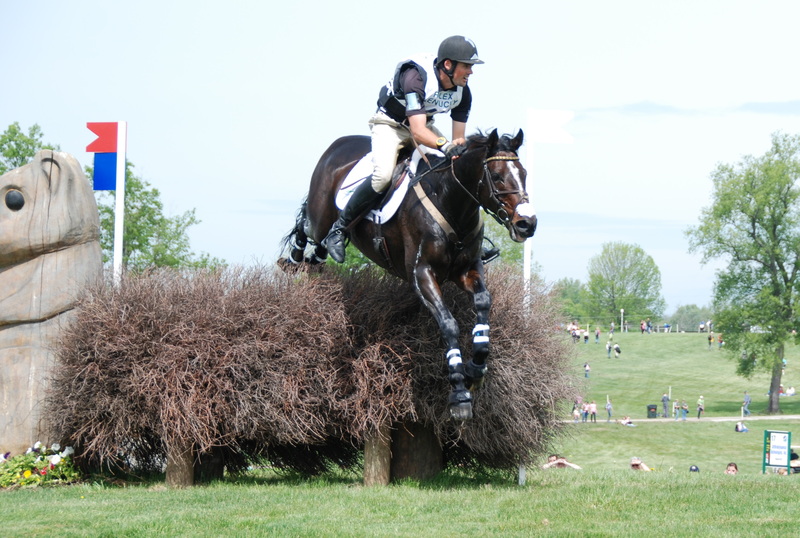 #36, Boyd Martin on Remington XXV dropping into the Hollow, fence #21. 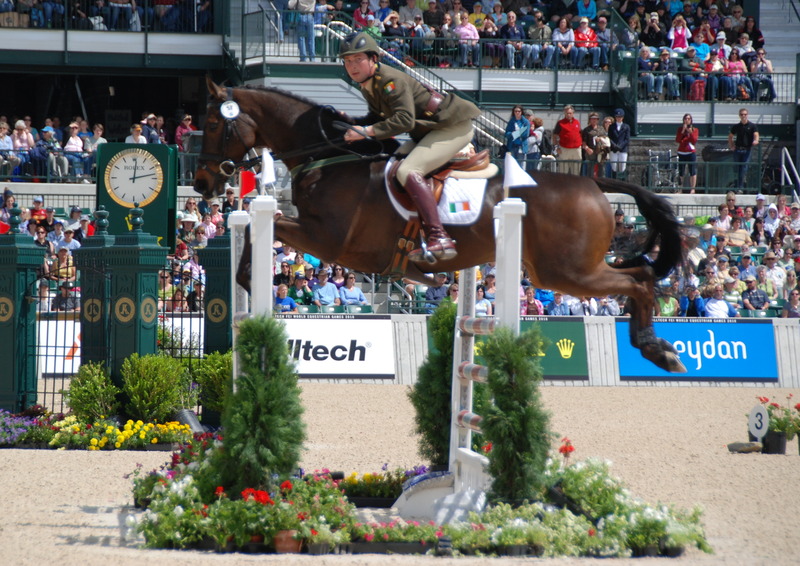 This jump proved to be difficult for several riders, with three falls over the course of the day. 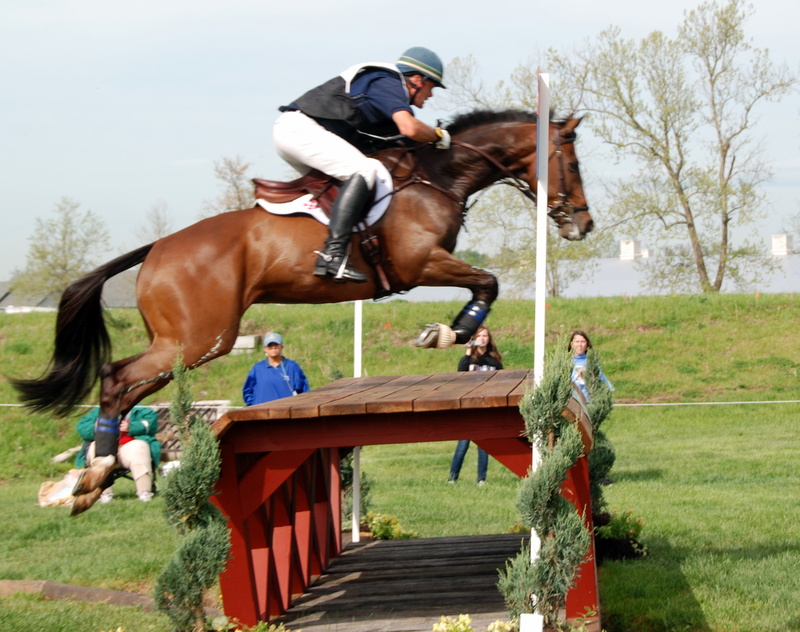 #41, Jonathan Paget of New Zeland on Clifton Promise over the first of the two Squirrels (fence #17). #67, Tara Ziegler on Buckingham Place dropping into the water at #15B -the Head of the Lake. 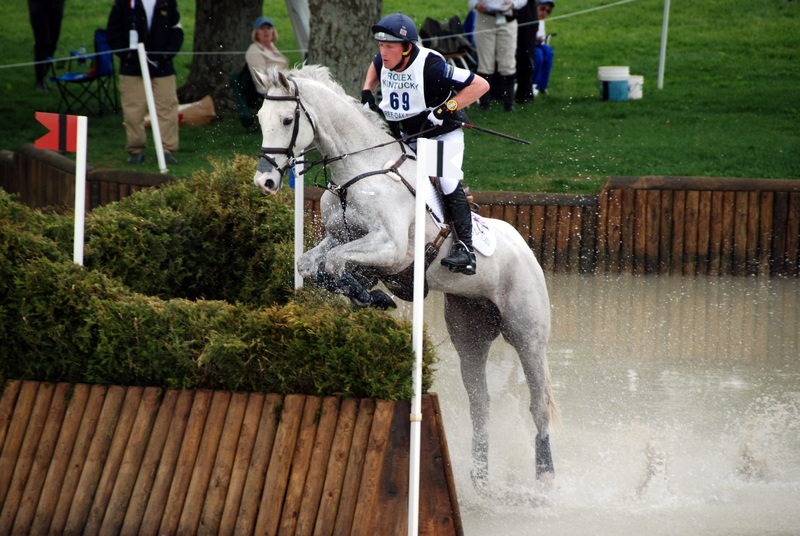 #69, Oliver Townend of Great Britain on Ashdale Cruise Master over part C at the Head of the Lake. Just a few minutes later, he suffered a serious fall and was brought to the UK hospital. 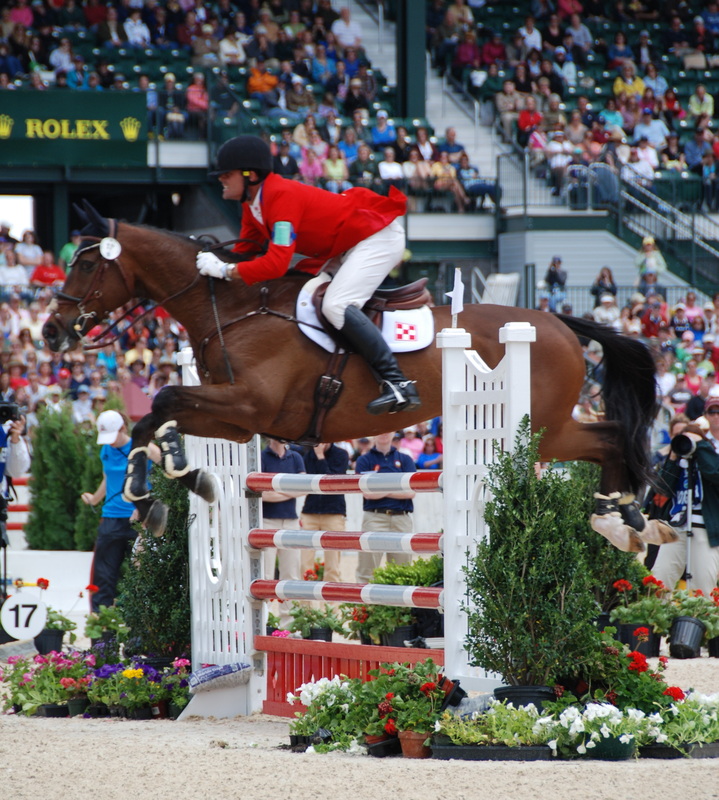 Reports say that thankfully both he and his horse are OK.
After the Cross Country we headed out to dinner, and returned to the park for the WEG Stadium Jumping Grand Prix Test event – only to find out that it had been canceled at the last minute. So I am sorry, but no stadium jumping pictures until we report back from phase 3. 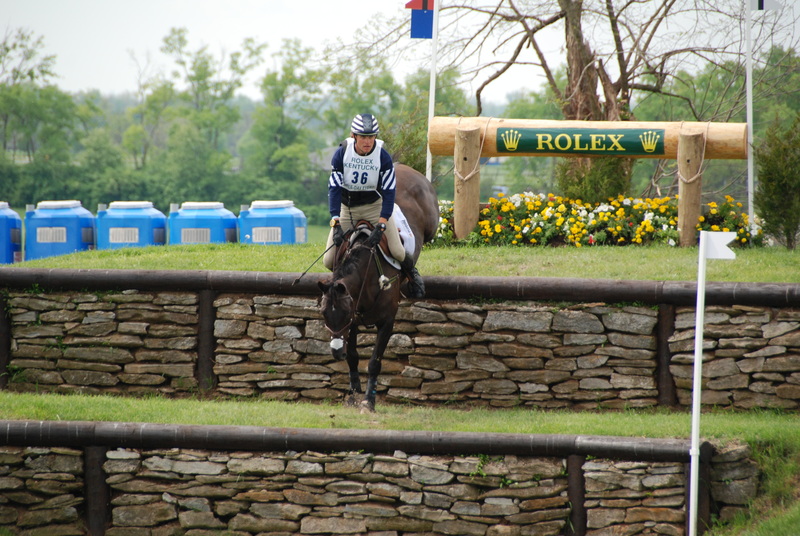 Our team made it out to Rolex with less difficulty than some of this year’s European competitors. Unfortunately we got just as wet today as they did. Showers and occasionally moderate rain dogged today’s early rides. By noon things were looking up and the riders after lunch all had dry rides. The competition is stiff, and even with this year’s difficult test, 9 riders have scores under 50 going into the Cross Country phase. To see the latest scores, click here. 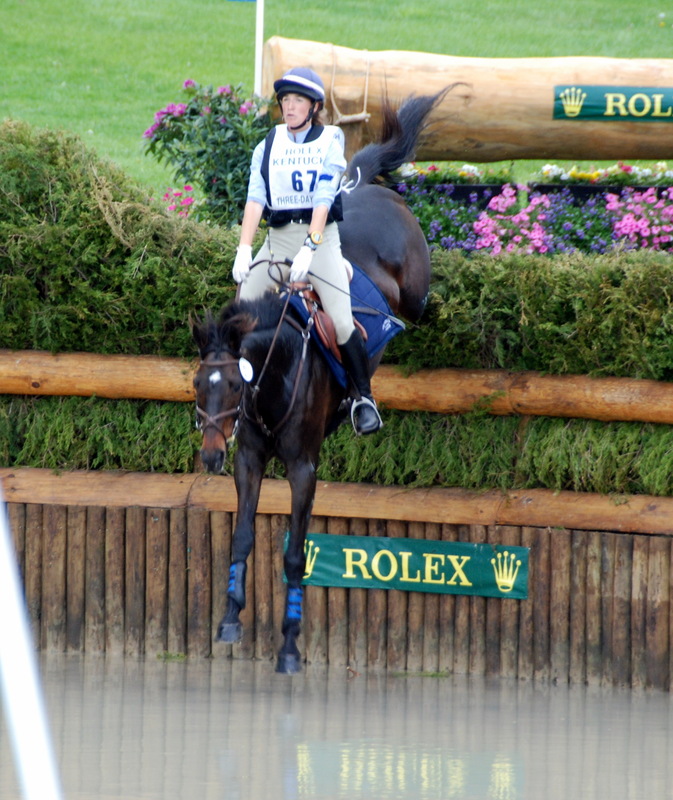 To see general news about this year’s Rolex Three Day, click here. 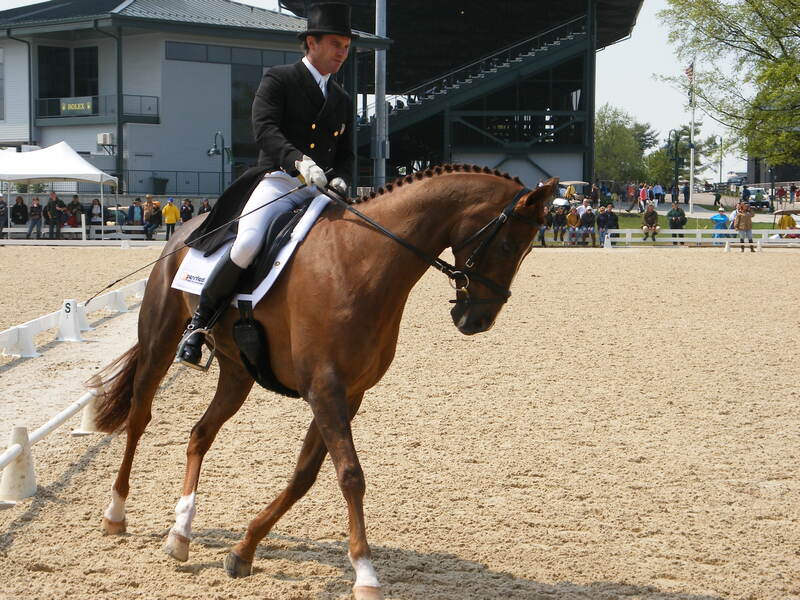 Here is a shot of Oliver Townend warming up on Ashdale Cruise Master. The pair is currently in 6th place. A groom’s job is never done! 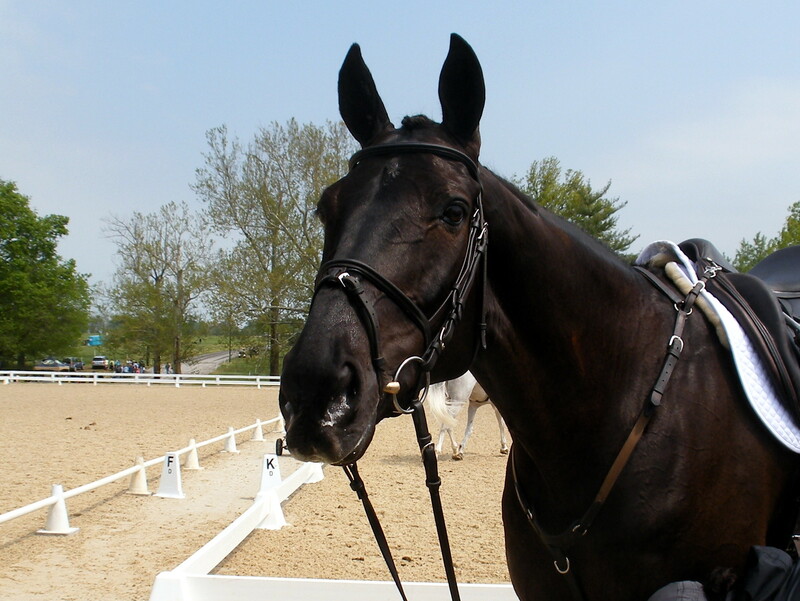 This is Amy Tryon’s Horse Coal Creek after their test. Finally, a shot of Phillip Dutton warming up on Waterfront. 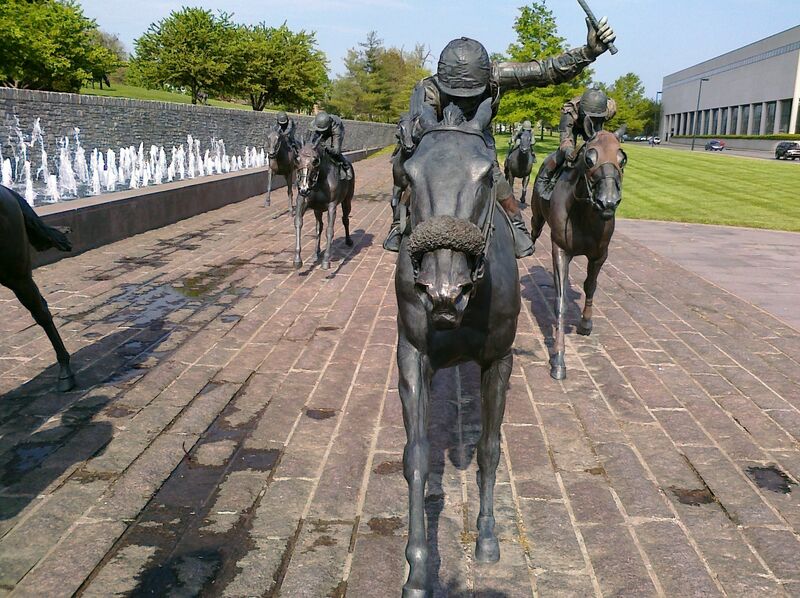 After the Dressage Test wrapped up, we headed in to Lexington to see the sights. We ended up at Thoroughbred Park. We’re hoping you already know, but if you haven’t heard, today is Earth Day. 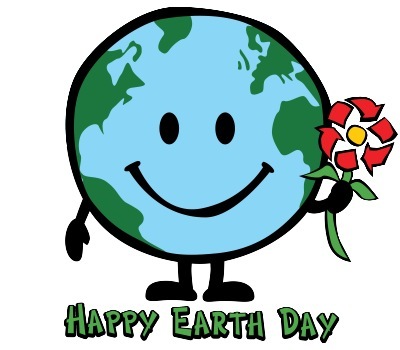 Started in 1970, the day is designated to promote environmental awareness.